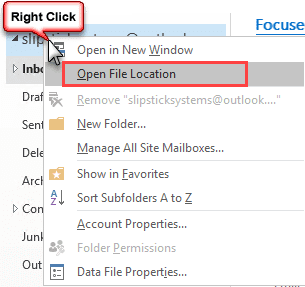 Long-time users of Microsoft Outlook know that it's relatively easy to relocate a Personal Folders .pst file from one folder or drive to another. Just exit Outlook, move the file, then restart Outlook. When Outlook says it can't find the .pst file, you'll have an opportunity to point to the new location. The process isn't quite as easy if you're moving to a new computer, partly because of the sheer size of many .pst files and partly because you may have already set up Outlook with a profile on the new machine. The first step, of course, is to locate the .pst file(s) you want to move. In the Folder List, right-click the top level of your main file (the one with the clock and house icon; the file name may be your email address or 'Outlook Data File"), choose Properties, then click Open File Location. This will open File Explorer with the data file selected. Do the same with any other .pst files in the folder list. Then exit Outlook while leaving File Explorer open. You now know where the .pst files reside and can copy them to the new machine. If you don't have a network connection between the systems, you'll have to transfer the .pst files with removable media. A USB drive is recommended if you don't have the computers networked. Put the PST files in a folder named Outlook Files under your Documents folder. This is where Outlook stores the pst data files by default and where it will look for the files. If the pst file name is your email address, Outlook will use the pst file if you add that account to a profile as a POP3 account. So, now you have the .pst files on the new machine and can use them in your Outlook profile. 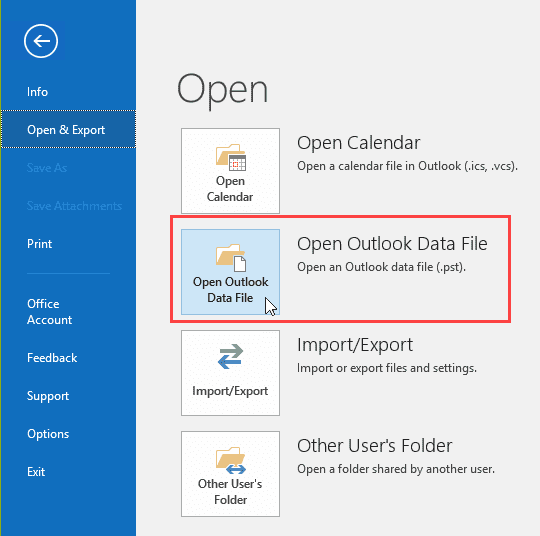 If you have a profile already, open the pst file using File, Open & Export, Open Outlook Data File. This adds the pst file to your profile. You can view messages, calendar, and contacts that are in the pst file, deliver POP3 mail to it, or set it as your default data file in File, Account Settings. If you don't have a profile created yet, start Outlook and choose Advanced > Manual setup in the wizard. You'll be able to select the data file as the delivery location for POP3 accounts after Outlook adds the account to your profile. See Outlook Backup and Dual-Boot File locations for more information on where Outlook stores key files that you might want to transfer. Where is Outlook's PST file?